Electronic or electrical goods can be purchased in virtually every corner of the globe. In advanced economies, almost all homes contain several — from computers to toasters, from toys to dishwashers — some of which are likely to be on their way out as a family plans to purchase the updated version of a particular device. Indeed, every day worldwide an estimated 123,000 metric tons of damaged, obsolete or simply unwanted electronic and electrical devices and appliances are discarded and become “e-waste”. As the social, environmental and economic risks posed by the growing volume of e-waste have become more apparent and more pressing in recent years, so has the need for sustainable solutions that reduce environmental impacts, increase resource recovery and enhance development opportunities. Those aims are behind a science-based initiative called Solving the E-waste Problem (StEP) — founded in 2007 by various UN organizations and coordinated by United Nations University (UNU) — that creates and fosters partnerships between companies, academic institutions and governmental and non-governmental organizations. Today, StEP has grown into an international initiative with more than 60 members worldwide. The initiative — hosted at theBonn-based SCYCLE (Sustainable Cycles) operating unit of the UNU Institute for Sustainability and Peace — initiates and participates in research projects to fill gaps in knowledge about e-waste and related issues. In 2003, the European Community (EC) enacted legislation regulating waste electrical and electronic equipment (WEEE). As understanding of the issue grows, the Waste Electrical and Electronic Equipment Directive has been most recently revised in July 2012. It now has the overall aim of seeing, by 2019, each of the 27 EU member states recycle 85 percent of the electrical and electronics waste generated on their territory, or 65 percent of the average weight of equipment placed on the market in the three preceding years. This will ensure that around 10 million tons, or roughly 20 kg per capita, will be collected. In 2011, the formal WEEE system in Italy achieved a collection performance of 4.3 kg per person. While in line with current directive targets, there remains a need to substantially improve the country’s WEEE collection in order to meet future targets required by the revised directive. Thus in 2012, UNU-ISP SCYCLE lead-authored a study on household WEEE generated in Italy on behalf of ECODOM (the leading Italian e-waste compliance scheme that manages the transportation and treatment of end-of-life appliances on a non-profit basis) in partnership with Politecnico di Milano and IPSOS. The research focused on the quantification of the country’s household WEEE, and on determining the main complementary (to formal schemes) streams like waste bins and non-reported recycling, which are where a major share of WEEE ends up. The results clarify consumer habits and disposal attitudes towards WEEE and will serve legislators in the formulation of strategies to achieve future collection target levels. Through a detailed reconstruction of the historical sales of different types of electronic and electrical equipment, the researchers were able to quantify the household accumulated stock; then, by also determining lifespan profiles of the various types of goods, the quantity of household WEEE generated was estimated. The report also examined disposal habits based on a specific survey designed and carried out in collaboration with IPSOS. The researchers note that the difference between the amount of equipment put on market and the volume of WEEE generated reveals a variety of market influences — including recent decreases in what is put on market mainly due to the financial crisis. Analysis of consumer habits revealed that, of current Italian household electronic and electrical equipment stock (which in total is equal to 215 kg/inhabitant, or 29.7 products per person) — over 10 percent (in weight) comprises products no longer in use, although functional, or even not working. These hibernated quantities account for more than 20 kg/inhabitant. This is nearly four times the quantity that passed through the country’s WEEE system in 2011. As shocking as that figure might be, some hopeful news is that the survey done for the study also revealed that, in nearly 14 percent of cases, there is no purchase of equivalent device/appliance when consumers dispose an old one. When it comes to disposal habits, consumers disposed of the majority of WEEE generated (44 percent in weight) through municipal collection points and 25 percent of is collected through retailers, where, especially for large appliances, household pick-ups prevail. However, only 38 percent (4.29 kg/inhabitants) of that was managed by the formal WEEE System. To date, a significant share of WEEE is directly sent to treatment from municipal collection points and retailers. Another 2.1 kg/inhabitant (12.9 percent of waste generated) was sent to reuse channels, but only 1.4 kg/inhabitant (8.6 percent of waste generated) is actually re-entering the market as second-hand goods. The remaining 0.7 kg/inhabitant is likely exported as used or sent to treatment. Another 0.6 kg/inhabitant is left by consumers in old houses. These flows represent 16.6 percent of total waste generated. It is thus fundamental to have proper accounting of these flows in the computation of collection target. The final portion is the 1.6 kg/inhabitants (10 percent of waste generated) that is disposed of improperly with other waste streams, ending up in landfills or receiving inappropriate treatment. This share can go up to 2.3 kg/inhabitant (14 percent of waste generated) when including uncertainty from consumers (i.e., they do not recall what they did with old equipment). This type of improper treatment is especially significant for the mixed (small appliance/equipment) WEEE stream. The good news is that estimation of WEEE generated in 2011 and the breakdown of different return channels shows a substantial consistency with actual performance of the formal WEEE system. However, streams at greater risk of “leaking” from such a system are those with a growing economic value in recent years (large household appliances and mixed WEEE). This is mainly due to a favourable economic situation in downstream markets, a progressive specialization and optimization of treatment processes, and a certain level of over-capacity especially in certain areas, leading to fierce competition between recycling plants to have access to waste to be treated. There are of course risks associated with the non-formal phenomena. Among them is the fact that growth of competition for access to waste can trigger a progressive race to bottom in treatment standards. The formal WEEE system, through agreements with national recycler’s associations, ensures that full treatment of household WEEE only occurs in certified plants. This guarantee does not exist for complementary streams. Most recent official data (2009) on exports of WEEE (and components) reveal that approximately 2,500 tonnes of household WEEE have been exported (mainly to Germany and Austria), while over 110,000 tonnes of non-household have been exported (mainly to China and Pakistan). However, consistency and frequency of reporting is significantly different between the formal WEEE system (monthly) and complementary channels (occurring only once a year). The report authors assert that that timely and consistent monitoring of all those involved in the supply chain for collection and treatment can guarantee a greater control over overall performance of the country. being updated dynamically, based on additional information, data and evidence allowing a timely adjustment and improvement of optimal strategies for the achievement of collection targets. For further information on the “Household WEEE Generated in Italy” report, contact UNU-ISP Research Associate Federico Magalini. Existe un redituable mercado en la reutilización de los residuos de materiales electrónicos que no está siendo aprovechado en Latinoamérica: sólo el 10% del oro, plata y cobre de la basura electrónica es reciclado teniendo en cuenta que el 90% de un aparato electrónico es reciclable. Los motivos son variados. Por un lado, una estructura de reciclaje aún informal a la que se le destinan muy pocos recursos y por otro, la falta de acuerdo entre gobiernos y empresas acerca de la necesidad de una ley que regule el manejo de éste tipo de desechos. Cuando hablamos de desechos, nos referimos a desechos electrónicos de teléfonos celulares, baterías, computadoras y todo tipo de aparatos que contengan oro, plata, cobre y otros minerales. El re-aprovechmiento de los minerales no sólo sería ecológico sino que generaría un mercado de grandes proporciones. Según los datos de la Unesco, en América Latina y el Caribe ya se acumulan más de 800 mil toneladas de desechos informáticos. Las cifras más certeras son las que difunde la Plataforma Regional de Residuos Electrónicos en Latinoamérica y el Caribe (Relac), e indican que los latinoamericanos tiran entre 2,4 y 4,2 kg de basura del año. Sin embargo, siendo que las cifras son de 2010, los especialistas estiman que la cifra podría haberse duplicado en los dos últimos años; el problema continúa siendo la falta de números oficiales al respecto. Puntualmente en Argentina, Greenpeace comunicó que durante 2012 se desecharon 10 millones de teléfonos móviles, que contienen 12,5 millones de dólares en oro, 1,8 millones en plata y 664.000 en cobre. De acuerdo con estimaciones del grupo ecologista, si el país hubiera reciclado los 10 millones de teléfonos celulares que fueron descartados en 2011, habría obtenido casi US$12,5 millones en oro, US$1,8 millones en plata y US$664.000 en cobre, un número para nada despreciable. En Estados Unidos y Europa la legislación que obliga a los fabricantes a ocuparse de los deshechos que ellos crearon, dado que la logística es fundamentalmente el problema con la gestión de la basura electrónica. El negocio puede ser muy redituable con la salvedad que el productor debe encargarse de transportar los desechos hasta la empresa de reciclado, cuestión que también encarecería los costos de las primeras y que son el principal motivo por el que no quieren hacerse cargo de su traslado. Organizaciones protectoras del medio ambiente y empresas de reciclado pugnan por una ley que fuerce a los fabricantes a ocuparse de recolectar los aparatos que producen, el nudo del problema de la basura tech. ¿Cuál es la situación en la región? Muy pobre. En Argentina un proyecto de “Ley de Basura Electrónica”, impulsado por organizaciones ambientalistas recibió media sanción del Senado en 2010, pero perdió estado parlamentario a fines de 2012 y por el momento no avanza. En Colombia, el Ministerio de Ambiente y Desarrollo Sostenible anunció en 2012 que 41 empresas ( 45% del mercado de empresas tecnológicas) conformaron el “sistema de recolección selectiva y gestión ambiental de residuos de computadores y/o periféricos” de Colombia. Bajo el nombre de EcoCómputo centraliza la gestión de de recolección, transporte, almacenamiento, tratamiento y aprovechamiento de este tipo de residuos. Por su lado, si bien en Costa Rica durante 2010 promulgó la Ley para la Gestión Integral de Residuos, su aplicación concreta sufre obstáculos como la “cuota” de reciclado que debe cumplirse cada año, una cifra sobre la que la industria local tecnológica no se pone de acuerdo. Brasil creó por lo menos 12 programas relevantes de separación de materiales en las ciudades de Curitiba, San Pablo, Porto Alegre, Santos, Sao José dos Campos y San Sebastiáo. Finalmente, en Chile, el proyecto REP Chile (Responsabilidad Extendida del Productor) diferenciará normas entre grandes y medianas empresas para fomentar el reciclaje de una manera justa, que se ajuste a los costos de producción y el tamaño de las compañías. Delhi Digests is a Sketchbook on E-waste and as such it is an ongoing space to explore ideas and collect materials to reach a better understanding of what the question of e-waste in Delhi entails. Through videos, photos and a series of conversations with activists, waste-pickers, urban planners, journalists and bureaucrats, Delhi Digests includes multiple voices and images to explore how citizens, state and corporations coexist. It suggests a political take on e-waste, looking at it as an indicator of democracy and a measure of equity in society. Artists often maintain sketchbooks to explore, document, organise and revise ideas. They evolve from rich, spontaneous journeys of gathering information, awareness and realisations about a theme. Sketchbooks are a kind of collage, a series of non-linear associations of ideas and information. They seldom seek to be comprehensive or conclusive. 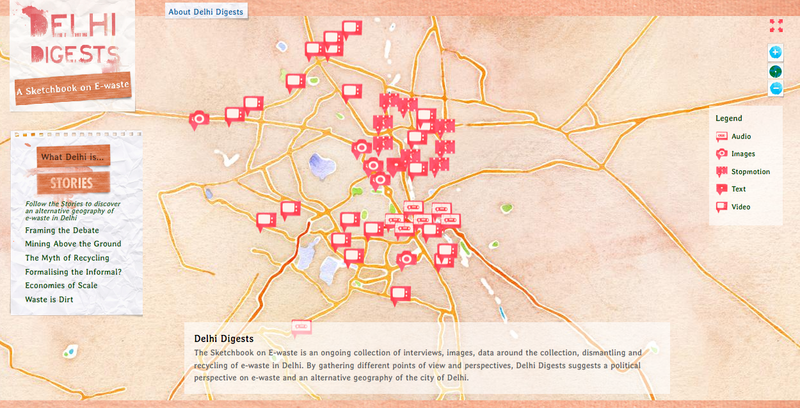 Taking inspiration from this concept of the sketchbook, we have created Delhi Digests as an online platform to present multiple perspectives on e-waste, and critical overviews which combine qualitative and quantitative methods of data collection. Delhi Digests proposes six stories and different keywords to navigate these complex debates. The combination of these multiple layers allows an alternative geography of Delhi to emerge and provides insight into how a city is shaped by what it digests. Delhi Digests employs a creative and interdisciplinary approach to aggregate and present information on e-waste through infographics, statistics and databases, maps, photographs, video and audio material as well as interviews with and testimonies of individuals and organisations. This information was aggregated through two visits to Delhi and the support of Toxics Link and the All India Waste Pickers’ Union. In presenting this information we’ve tried to expose the many controversial positions on e-waste through the realities of people associated with its management. The Delhi Digests Sketchbook on E-Waste is a practical exploration of a broader theme of work we’ve called ‘Exposing the Invisible’. With our ‘Exposing the Invisible’ projects, we aim to reveal the hidden commentaries, politics and realities about an issue through the artful and careful curation of information about it. And so the Sketchbooks are also another iteration of an idea and a practice that we call Information Activism. Noventa por ciento de los residuos electrónicos de India se recicla informalmente. ¿Cuándo reconocerán esto las políticas del gobierno? De acuerdo con el informe GISWatch 2010, [en inglés] el de la electrónica es el sector de más rápido crecimiento en India, con un mercado cercano a 52 millones de personas. De 1993 a 2000 el número de computadoras en circulación creció 604% y quién sabe cuántas se compraron desde entonces. En 2010, India produjo más de 300 mil toneladas de residuos electrónicos pero casi el doble de esa cantidad (unas 500 mil toneladas más) entró al país ilegalmente. India se convirtió en EL vertedero de basura electrónica de Asia. Un nuevo informe [en inglés] encargado por la Asociación para el Progreso de las Comunicaciones (APC) y escrito por Osama Manzar y Divya Menon de la Digital Empowerment Foundation (DEF) con sede en Delhi, echa una mirada crítica a lo que se hace en el país para gestionar los residuos electrónicos. APCNoticias entrevistó a Divya Menon, co-autora del informe. Si bien en los últimos años el gobierno indio aprobó una serie de leyes de protección medioambiental, ninguna trata específicamente sobre la basura electrónica. Por lo general, los desechos electrónicos se agrupan en la sección de “residuos peligrosos”, como en la Ley de Protección Ambiental de 2000 elaborada por el Ministerio de Medio Ambiente y Bosques (MMAB). Las políticas vigentes abordan la producción y el comercio de productos y servicios electrónicos pero no tratan el tema de la disposición final de los productos una vez que se vuelven obsoletos. Sin embargo, el MMAB está finalmente comenzando a abordar la gestión de los residuos electrónicos en India y presentó un proyecto de normas desarrollado en colaboración con la Asociación de Fabricantes de la Industria TI, GTZ, Greenpeace y Toxicslink, llamado “Reglas (Gestión y Manejo) para Residuos Electrónicos 2010” y basado en la Ley de Protección Ambiental de 1986 (artículos 6, 8 y 25). Estas reglas, formuladas para regular la gestión de los residuos electrónicos en India, se encuentran actualmente abiertas para observaciones y se prevé su entrada en vigencia para 2012. “Aplaudimos estas reglas y consideramos que son una respuesta positiva a la demanda por una política más rigurosa de gestión de residuos electrónicos”, dice Menon. “Las nuevas normas establecen una lista detallada de las responsabilidades de las distintas partes involucradas. Pero no tienen en cuenta la problemática relacionada con la integración de los/as recicladores/as informales”. Éste es un problema grave porque el sector informal se hace cargo del 90% de los desechos electrónicos del país. “Es esencial que se incluya a los/as recicladores/as informales en toda política de gestión de residuos electrónicos a largo plazo. La legislación se ocupa del papel de los/as recicladores/as formales pero carece de un marco definido sobre cómo los/as consumidores/as deben eliminar la basura electrónica y es poco realista esperar que los proveedores de productos electrónicos lleven a cabo un seguimiento de quién compra qué y cuándo”, añade Menon. “La cuestión de la gestión de los residuos electrónicos en India no es tanto si se reciclan o no, sino más bien cómo se reciclan”, dice Menon. En India, la basura electrónica no se acumula en los lugares públicos ni los botes de basura están llenos de computadoras portátiles y teléfonos celulares viejos. Los/as recicladores/as informales van rápidamente de casa en casa para recoger los artículos que ya no se usan, extraen de ellos lo que les interesa y luego los queman o los destruyen. “Los/as recicladores/as informales son generalmente niños/as. Vienen de familias con antigua tradición de reciclaje y simplemente asumieron el de los residuos electrónicos como una extensión del reciclaje que ya realizan”, explica Menon. El problema es que simplemente despedazan los artículos para abrirlos y extraer lo que les interesa. No tienen acceso a ropa o a equipo protector. Y no tienen educación cómo para manejar los productos químicos ácidos que luego son liberados en el medio ambiente y las fuentes de agua. En lugar de eliminar a los/as recicladores/as informales del proceso y recortar sus medios de subsistencia, en su informe DEF sugiere crear un puente entre los/as recicladores/as formales e informales, donde estos últimos podrían seguir recolectando los artículos de desecho pero venderlos a centros de reciclaje formal, lo que permitiría a los/as recicladores/as formales realizar su correcto procesamiento. “La sociedad civil tiene un papel importante que desempeñar en el desarrollo de políticas de residuos electrónicos. Por lo general, en India el trabajo de la sociedad civil se ha limitado a la incidencia política y a la investigación pero también es importante crear una mayor conciencia sobre los temas que conciernen a la parte más baja de la pirámide social”, dice Menon. “Sobre todo porque la red de la sociedad civil logra llegar a niveles de la sociedad sólo superados por el alcance gubernamental hacia las organizaciones de base. La sociedad civil puede actuar como un mecanismo de transición entre los sectores formal e informal”, sugiere. Menon reconoce una tendencia favorable en el gobierno que se traduce en la creación de políticas más conscientes del ambiente. Por ejemplo, la elaboración de políticas de gestión de residuos electrónicos y la promoción de un uso más ecológico y eficiente de las tecnologías de información y comunicación en el país. Sin embargo, el informe concluye que la gestión de residuos electrónicos depende de las capacidades de todas las personas involucradas en el proceso. El gobierno local, el papel de los/as recicladores/as formales, la concientización y las actitudes ciudadanas, así como los fabricantes y los grandes consumidores. Todo depende de que los diversos actores logren trabajar juntos, compartir conocimientos, recursos y tecnología. “Los mecanismos de adquisición, uso, distribución y eliminación sustentable de las TIC deben orientar los programas de desarrollo social y económico y el gobierno indio debe estar dispuesto a debatir y aprobar legislación clave respecto de las TIC y el medio ambiente”, concluye el informe. Y agrega: “los/as recicladores/as informales deben estar incluidos/as oficialmente para que puedan continuar con la recolección y la clasificación y entregar la basura electrónica a los/as recicladores/as formales para que pueda ser eliminada de forma segura”.